I’m not sure if this automotive Frankenstein is a good thing or a bad thing. I guess it depends on if you like heavily modified trucks. Someone has taken on OJ-era Ford Bronco and gutted it leaving only the body shell behind. This might bother Bronco purists a bit. The builder then took the running gear and chassis out of a 2011 Raptor truck, shortened the chassis, and then bolted the Bronco body on. That may anger the Raptor fans out there. Anyway you cut it, the result is a very cool Bronco that has some serious off-road chops. 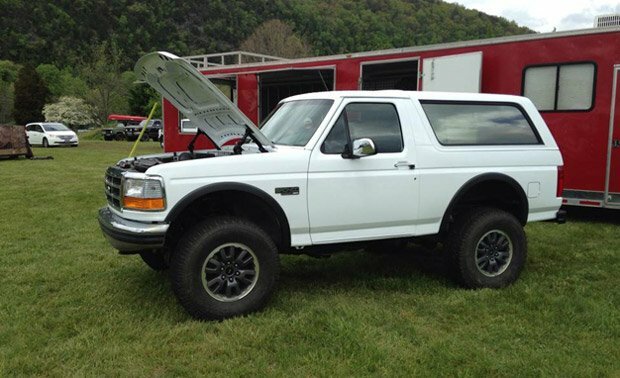 I can only imagine the work it took to get the Raptor chassis shortened to fit the Bronco body. I also wonder if this mutant truck drives well. It certainly seems to in the videos, but any time you go to cutting on a vehicle you can really mess up its handling characteristics.